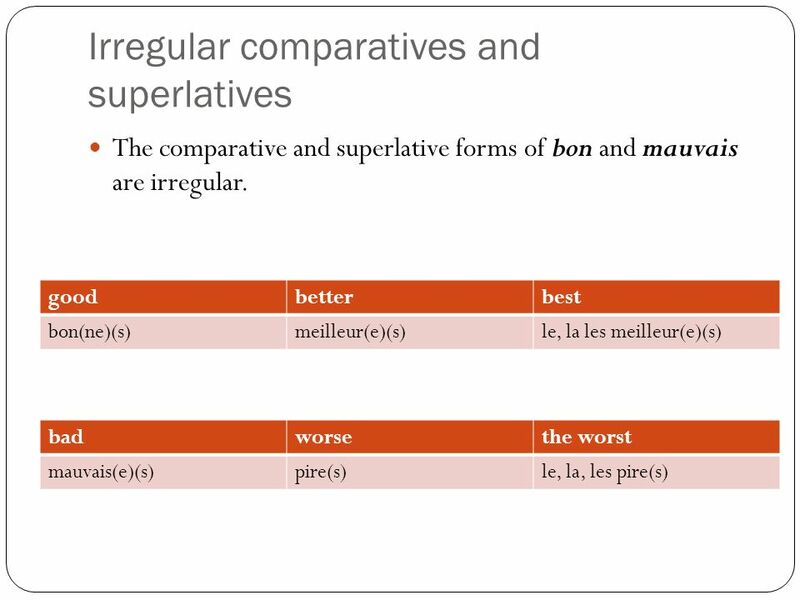 You can use the following expressions with adjectives to compare things and people. Make the adjective agree with the noun in gender and number. With c’est, there is no agreement. plus + adjective + que more...than La ville est plus bruyante que la campagne. The city is more noisy than the countryside. aussi + adjective + que	as...as La ville est aussi intéressante que la campagne. The city is as interesting as the countryside. La ville? C’est aussi intéressant que la campagne! moins + adjective + que	less...than La campagne est moins polluée que la ville. The countryside is less polluted than the city. 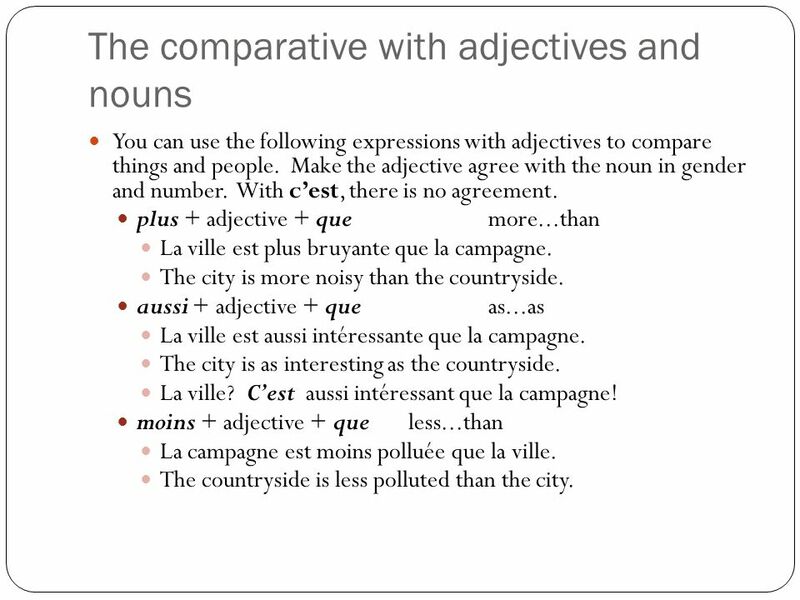 You can also compare nouns using plus de, moins de and autant de before the noun. 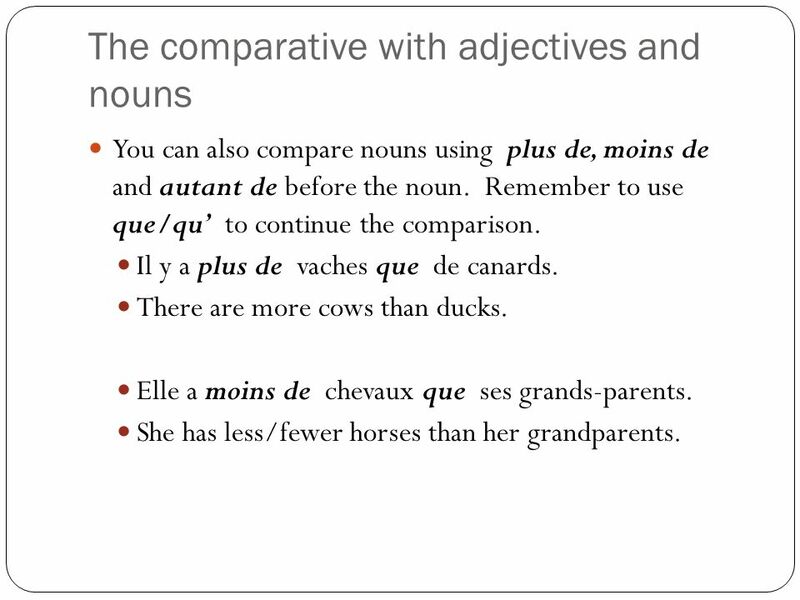 Remember to use que/qu’ to continue the comparison. Il y a plus de vaches que de canards. There are more cows than ducks. Elle a moins de chevaux que ses grands-parents. She has less/fewer horses than her grandparents. To say the least or the most , use the following structure. Remember to make the adjective agree in gender and number with the noun. 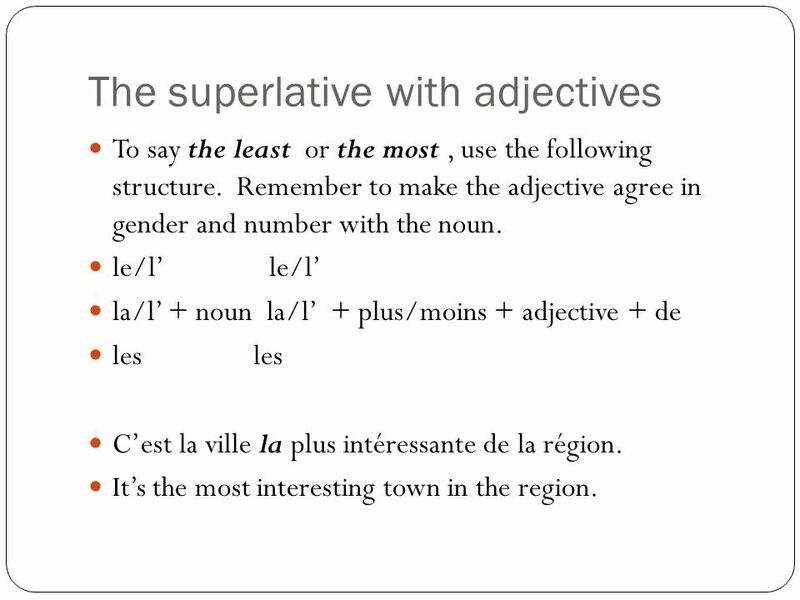 le/l’	le/l’ la/l’	+ noun la/l’ + plus/moins + adjective + de les les C’est la ville la plus intéressante de la région. It’s the most interesting town in the region. 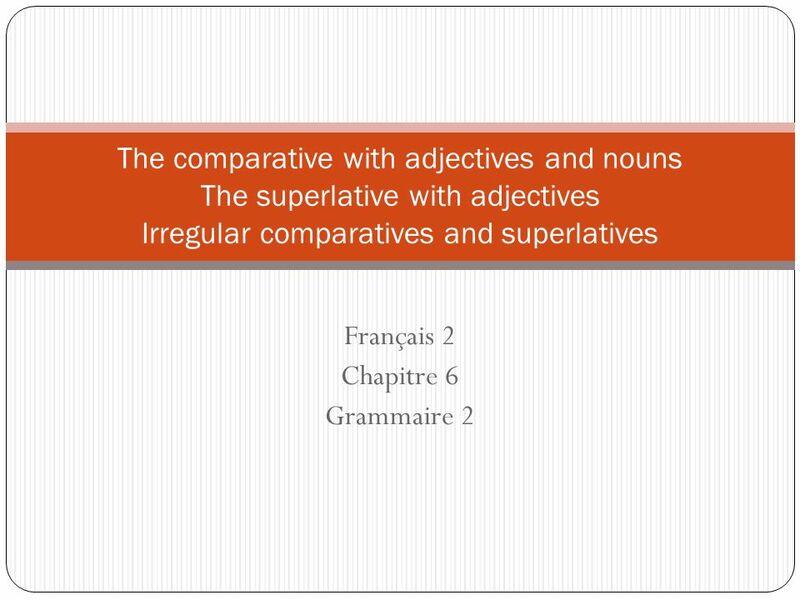 Download ppt "Français 2 Chapitre 6 Grammaire 2"
C’est / Ce sont Versus Il / Elle est Ils / Elles sont. Le Comparatif We use the comparative to compare: 1) Two things or two people: Ex:La Chine est grande. China is big. Le Canada est plus grand que la Chine. Le verbe être au singulier The verb to be. La norme Comparisons 4.1 Understanding the nature of language through comparisons. Adjectives that Precede the Noun. 1. Most adjectives in French FOLLOW the noun they modify. ex. Les amies amusantes sont à lécole. 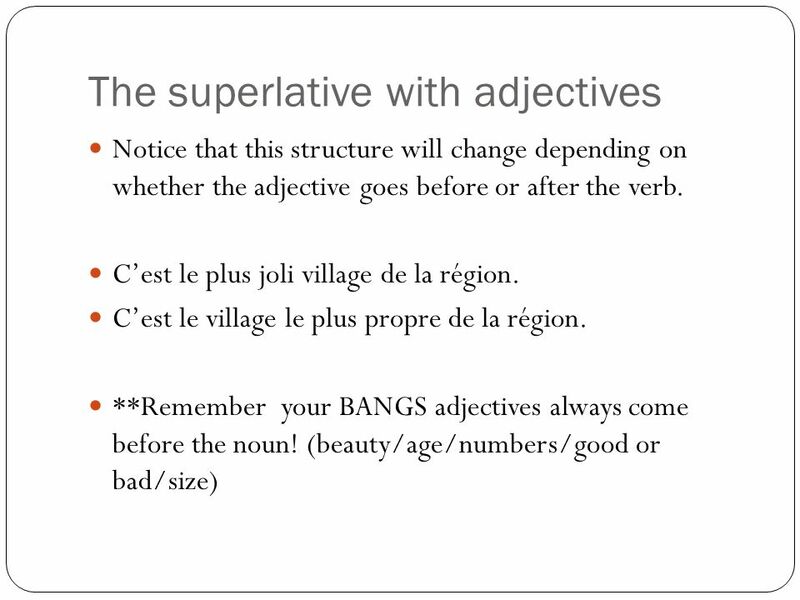 Le Subjonctif Its a verb Mood, along with the Imperative and the Indicative. A. 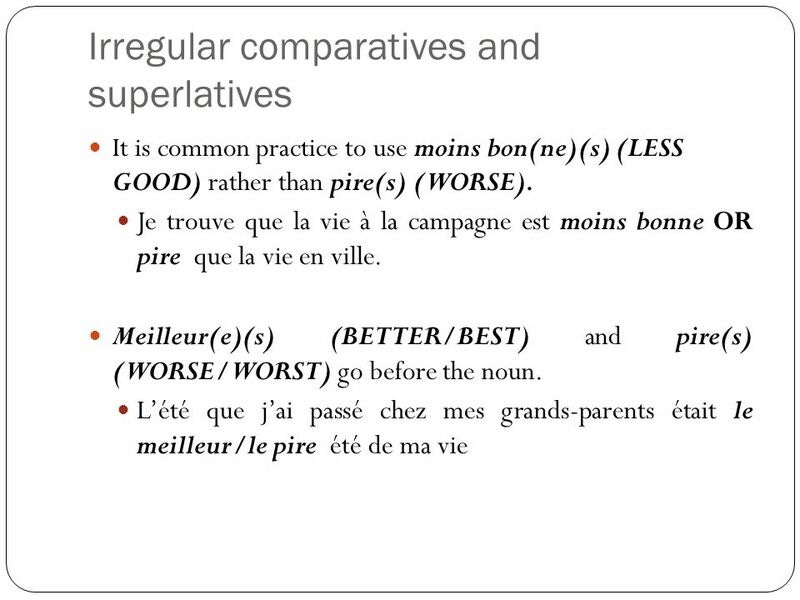 Le comparatif p.234 Comparative constructions are used to compare people or things. Cet hôtel est aussi moderne que l’autre. This hotel is as modern. 1.2 © and ® 2012 Vista Higher Learning, Inc The irregular verbs être, avoir, faire, and aller The four most common irregular verbs in French are. Relative Pronouns Relative pronouns are words that connect two clauses of a sentence to create a more complex sentence rather than having two simpler.